Although often referred to as Miniature Siberian Huskies or Mini Huskies the Alaskan Klee Kai is actually a separate breed, and shares only part of its ancestry with the Siberian Husky. Originally bred by Linda Spurlin in Alaska in the 1970s, the breed is more closely related to the Alaskan Husky which is mix of various sled dog breeds and others to produce a winning sled-race dog. Although not recognised by the AKC the Alaskan Klee Kai does have recognition by the United Kennel Club (UKC) and American Rare Breed Association (ARBA). The Klee Kai makes a good alternative to the rare Miniature Siberian Husky, because they are of a similar size, temperament, but with a lot more breeding stock are easier to find. For all three sizes the behaviour and health concerns are similar. Smaller sizes are (of course) going to eat and exercise less than the larger sizes. Their ancestry in the Alaskan Husky makes this dog also relatively strong for its size. Keep that in mind if you are comparing the Klee Kai to “lap dogs” of similar heights, because this one will likely have a bit more muscle mass on it. When talking to breeders or purchasing Alaskan Klee Kai puppies you will want to be sure of the size category that the particular dog has been bred for. If the owner can’t tell you then that’s a warning sign that the dog might have come from a puppy farm and should be avoided. Responsible breeders are trying to improve the breed, not make a buck because the breed is popular and in demand. The Alaskan Klee Kai is prone to a sensitive stomach issue, but not the hip or eye problems that Siberian Huskies can have. Their historical breeding stock means that coats and colours vary and can be quite different from standard Huskies. They still need lots of exercise and shed hair which requires regular grooming, although with their smaller size comes less fur to leave around the house! Note that because the breed is relatively new, and the gene pool small, newly discovered traits may be discovered as the breed is developed further. For example, there is anecdotal evidence that the Klee Kai is prone to hydrocephalus – a typically fatal condition affecting the brain of toy sized dogs. Further research is required to produce some definitive conclusions on whether the Alaskan Klee Kai is particularly prone to this and other serious health concerns. Not unlike the temperament of a Siberian Husky, The Alaskan Klee Kai can be energetic and require plenty of mental stimulation. Their curious nature can lead them to mischief, so be sure to keep them well exercised and entertained. A Klee Kai not getting enough exercise may resort to boredom and destructive behavior, so be sure to go for daily walks and engage in play. Also like Siberian Huskies the Alaskan Klee Kai has a natural prey drive. Leash training will be critical, and you will need to think carefully before letting your Klee Kai off-leash. We have some specific tips for off-leash training that you might want to consider before acquiring a Klee Kai. If you are not comfortable owning a dog that will be leashed at all times outside your back yard then you might want to consider a less active breed. Being a smaller dog you are most likely to find the Alaskan Klee Kai better for companionship, rather than as a working dog. This breed won’t be mushing sleds along with you on board! However exercise is still required to maintain a healthy, happy puppy. Their inquisitive temperament can work with you in obedience training. They will enjoy you taking lead and “showing them the way”. You need to be the master, the alpha dog of the pack, and a Klee Kai will respect you. 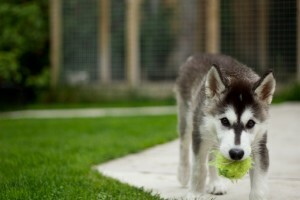 Use the training tips we have provided for Siberian Huskies and you will have great success training your Klee Kai too. As with any adoption be prepared to take a dog in as a trial for a period to see if it fits your family and your lifestyle. Also like any dog that has been rescued it might have some special socialization issues that will decide the kind of environment best suited to looking after the animal. We have more information on adopting here. The Alaskan Klee Kai has its root in the Alaskan Husky, rather than the Siberian Husky, however all three of these breeds are similar. You will find the Klee Kai a somewhat mischievous dog, clever, and high in energy. The smaller size will make the Alaskan Klee Kai better suited to those who can not fulfil all the exercising requirements of a full sized Siberian Husky, but still have an active lifestyle. The smaller breed stock means you might need to hunt around and ask local clubs for referrals to breeders, plus waiting periods may apply. However they are not as rare as Miniature Huskies and providing there is a breeder in your area, it will not be impossible to find one.